Kung Hai Fat Choi to my blogger friends. You must be wondering why I am wishing months late when it was celebrated on Friday 16th February 2018. The reason is nostalgia for the colors, festivities, decorations, entertainment and the urge to travel. 2018 was to be my year of travel, of discoveries, of adventure. But the three turned out to be of another kind….surreal, painful and which took me time to understand, to come to terms with. I celebrated my birthday on a hospital bed (Jan 2) and hereby started my second journey, a ‘changed’ lifestyle. Friends and family assured me that I have a fresh lease of life and in keeping with the spirit of ‘change’ fossicked through photos documenting my years of travel, of moving from place to place, luxuriating in the best of expat life. There were no qualms about job loss as I was never one for a 9-5 job, except for a year in a newspaper office. The one regret was disrupting school life of daughter and son and anyone residing in India can vouch how difficult it is to manage admission in top schools. They were studying in the best schools in New Delhi but when the move to Muscat, Oman was discussed it was a unanimous family decision of going. By second re-location, India and Hong Kong, they had winged their way to university and jobs in USA. Enchanted Island: A CNY 2018 digital card is an euphoric reminder of the pageantry of Chinese New Year celebrations. Somehow, I missed out on the celebrations, two years in a row now, fast turning into a humongous festival transmogrifing the city into a commercial cornucopia of fancy decorations, red and themed lanterns, flowers, potted mandarins, neighbourhood markets and food. Friends informed me that 2018 celebrations were subdued, no fireworks, as respect to lives lost in the tragic bus accident in Tai Po. I recollect my first CNY in 2009. It was the Year of the Ox or Cow and the Ox presided over the city. The Chinese calendar is a 60 year lunar cycle with each cycle further divided into five smaller cycles of 12 years each. 12 animals, Dragon, Tiger, Sheep, Rooster, Rat, Rabbit, Dragon, Snake, Dog, Pig, Horse and Monkey, rule the chart and transfer their energies and characteristics to the signs. Asian festivals are incomplete without mythological attachments and CNY is no exception. Legend refers to a mythical beast called Year or Nian resembling an Ox with head of a Lion. This creature inhabits the sea and emerges on night of New Year’s Eve to frighten and harm people, properties and animals. Bursting firecrackers, posting red Dui Lian in front of houses and hanging red lanterns are ways to chase away Nian as the creature is supposedly afraid of red color, fire and loud sounds. The day ends with ‘Shou Sui’ or New Year’s Eve dinner with family and relatives staying awake till midnight to keep ‘Nian’ at bay. The family dinner is a lavish affair with preparations weeks in advance. I was hoping to get an invite ‘Sorry family only’, the look said it all. My friend and her children had been busy spring cleaning and decorating their home with bright red vertical ‘poetic’ banners, folk paintings, intricate paper cuttings, festive scrolls and lanterns. The customs and ceremonies trickle down generations and continue to this day. What fascinated me were the ‘bright red envelopes’ flaunted by children and adults. 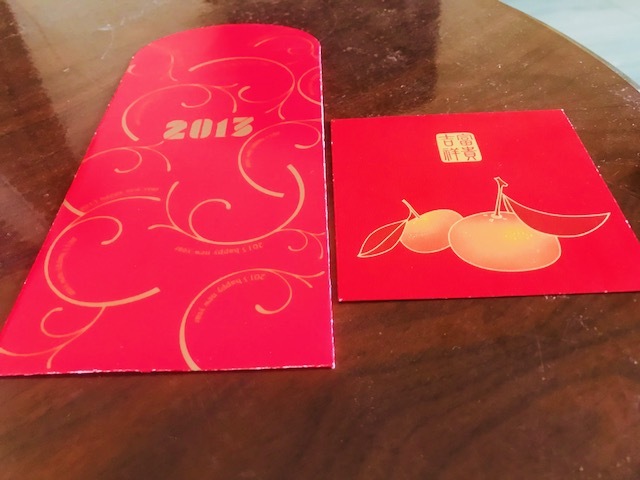 These red envelopes’ or ‘Lai See’ are ‘gift’ envelopes given by adults to children and by bosses to staff and other employees. The money is ‘new or crisp’ bank notes, this explained the queues in banks for new dollar bills few days before CNY, while the red envelopes are purchased from the market. The custom is similar to what we have, in India, when during Diwali, the family and relatives give children ‘new Rupee notes’. I would promptly deposit my money in the piggy bank while my brothers would use their ‘gift’ to buy extra crackers above what parents bought for us. They would later regret the money going up in smoke. 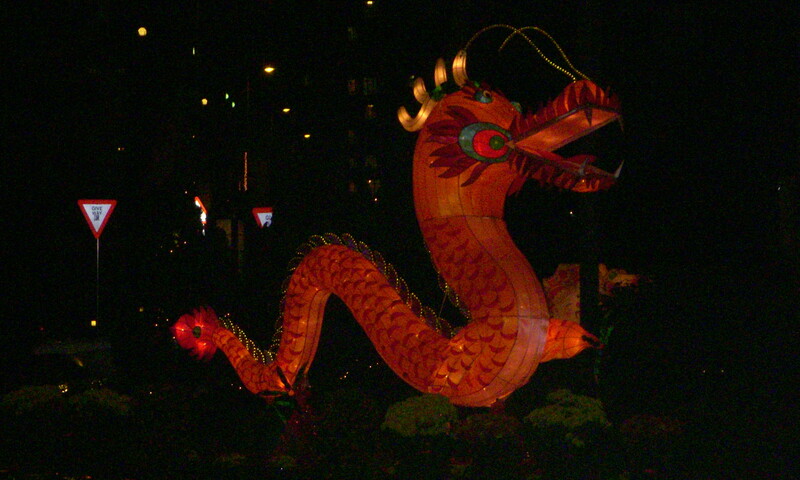 The Chinese New Year is a 15 day celebration and concludes with Lantern Festival. The lanterns are decorative pieces that are lit for an entire month during giving a surreal impression of a city floating on balloons. I search, in my cache, for past pictures of fireworks, the parades, the decorations and lanterns and find one of a flower market, somewhere in Mei Fu area, as during the festival markets sprout up in different areas selling household stuff, gifts, flowers and decorations. The missing pictures are a mystery as normally I am a click-friendly person and never leave home/apartment without my Nikon or iPhone. There is one of the Shenzhen border as one year we decided to visit Shenzhen (cross border train travel), hoping to get a crowd-free shopping opportunity. It was certainly crowd-free with deserted markets and malls, shuttered shops and eating-places. We walked around aimlessly and returned to Hong Kong to watch the customary Dragon dance at our residential complex, feeling foolish for wasting an entire day. CNY has a human angle as it is associated with the largest migration in the world when locals from all over China and even those living and working abroad make it a point to reach their ancestral or family homes in cities or remote villages. Watching media coverage of the surging crowds at railway and bus stations and airports I would wonder at the hardships of lugging gifts and suitcases, missing trains and bus connections or saving ticket money to add to the family kitty. But to the credit of authorities there are minimum glitches. 2018 is the year of the friendly Dog and I look at the ‘cuddly’ dog in the digital card and morbid thoughts creep in. I visualise the poodles, the pooches in booties and bows, strutting with their owners on the Tsim Sha Sui promenade and like then wonder if it was a ‘pet’ or a ‘dish’. Dog meat is a delicacy in Mainland China. Well, to each his own but one felt sorry for the trusting creature. Hopefully in 2019 I will be in Hong Kong to First: book a table in one of the Nathan Road restaurants for a birds-eye view of the parade. I do not want to get pulverized into a bone-stamp by the surging crowds, a repeat of near escape in 2012 when I managed to wriggle through the surging bodies. Second: I want to re-join the festivities, the rituals and traditions, Third: walk the streets, bargain hunt in wet markets (vegetable), empathize with caged birds in the Bird market, watch the twinkling lights from myriad vertical towers cavorting in the Bay, stride the glittering malls, the subterranean walkways and escalators connecting no-where to no-where. Maybe it is the compactness of Hong Kong or the quixotically familiar customs and celebrations that the Island City is the magnetic pull towards localization. Till then enjoy the ‘year of the Dog’ and read the predictions and select the best. What a fascinating glimpse of life in Hong Kong. What a spectacle Chinese New Year must be. I can see why you spent a day enjoying it. Seeing money go up in smoke would be rather disconcerting though.